The company's big reveal was pretty... boring. Elon Musk’s Boring Company just revealed its first completed tunnel to the world. Or at least, it’s the “first section” of its first tunnel, according to the company’s website. The company threw a massive party last night, showing off the tunnel to hundreds of members of the press and investors — rumor has it even Kendrick Lamar and Diplo showed up. Despite the fanfare and hype, reality leaves us wanting more — the Hawthorne test tunnel is still a far cry from the future the Boring Company promised us. 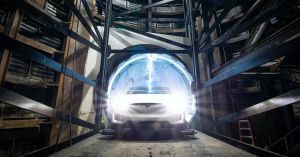 The Boring Company got a lot of attention back in 2017 thanks to a slick video of a Tesla parking on the side of the road before being swallowed by an elevator and zipping along on a skate through a system of wide underground tunnels. This year, we got another video of the company’s plans for high capacity passenger pods will be able to pick up passengers on the surface, which it said would speed through expansive tunnels at speeds of up to 150 mph (240 km/h). But those are visions are very different from what the company unveiled Tuesday. The first section of the Boring Company’s test tunnel stretches 1.14 miles (1.83 kilometers) from “O’Leary Station” — essentially a hole in the ground with a car elevator — near the SpaceX headquarters in Hawthorne, California to a parking lot nearby. The company also got permission to hook up a nearby suburban-style garage to the tunnel in the future. The tunnel is only 14 feet in diameter, which can fit a single Tesla car at a time. During the company’s opening event last night, invitees were chauffered down the tunnel in a Tesla Model X at speeds of up to 40 mph (64 km/h), The Verge reports. Rather than having custom passenger pods zip along the tunnels — Musk promised “road legal” autonomous cars in a December 8 tweet — a pair of small wheels attach to the underside of a Model X, and pull it along inside the tunnel. “The car is the skate,” Musk says, as quoted by The Verge. If you’re keeping score: no skates, no passenger pods, no promised 150 mph (240 km/h). Creating a web of high-speed transportation tunnels running underneath cities like Los Angeles is a Sisyphean task, and it will take a lot of time until we’ll see significant progress — The Verge suggests environmental regulations alone could add three to four years to the company’s timeline. But the Boring Company is well aware of this. There’s a reason its official mascot is Gary The Snail.